Let us Cater your Party or Family Event! 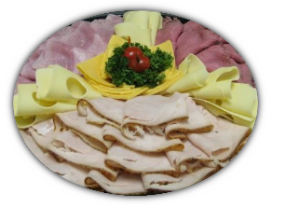 Not only do we provide delicous food in a family atmosphere we can cater your party or family event with a sandwich or meat and cheese tray. (or Lean Corned Beef), Swiss and Muenster cheeses. Other meat and cheese combinations available. enough for 1-1/2 sandwiches per person. accompany each meat and cheese tray. -- Lettuce & tomato is $.30 extra. -- Includes potato chips and pickle spears. combination of sandwiches off our menu. --Includes potato chips and pickle spears. . Imported Ham & Swiss) on your choice of bread. of condiments, salt and pepper, fork and napkin in each box. -- Five ounce portion per person of seasonal variety of fresh fruit salad. Price will vary with market prices. -- Available from our deli case at current retail prices. We recommend portion of 1/4 -- 1/3 pound per person. Amounts of 4 lbs. Available decorated in serving bowls for $3.00 extra. carrots, and celery with a homemade Ranch-style dip. -- Made with your choice of meat or meat and cheese combination. -- Includes pickle spears and potato chips. sugar and/or sweet and low. -- Assorted sodas and other beverages available at various prices. Macaroni Salad), Pickle and Olive tray, and Dessert tray of your choice. -- Available to suit your needs at a nominal cost. *THERE WILL BE AN EXTRA CHARGE FOR BELOW MINIMUM ORDERS.